As the monsoon session of the Parliament progresses, the possibility of the HECI Draft Bill being tabled before our legislators becomes more and more eminent. 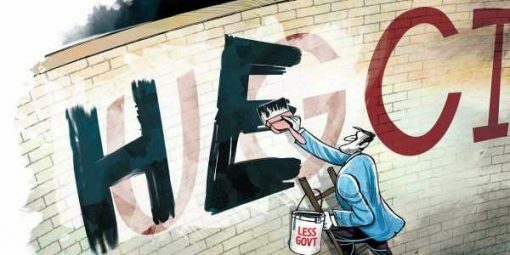 On 27 June, the Human Resources Development Ministry of the Government of India announced that it would repeal the University Grants Commission (UGC) Act and introduce a new regulatory body for higher education called the Higher Education Commission of India (HECI). The draft Higher Education Commission of India (Repeal of University Grants Commission Act) 2018 can be read here. While there is no denying that the University Grants Commission (UGC) has failed to discharge its obligations towards higher education, the Higher Education Commission of India (HECI) Bill is far from being the answer. The Bill, if implemented, will vest more powers in the Union Government, rob institutions of their autonomy and skew higher education in favour of the market place. Read more about the implications of the HECI Bill here. Even though HRD minister Prakash Javadekar, tweeted that that the MHRD will be receiving suggestions to the draft till 7 July, the possibility of the Bill being tabled at the moment means that it has been, yet again, pushed through without participation in detailed deliberation with educationists, teachers, students, and academic staff. Given the circumstances, we must request our legislators – especially members of the Opposition – to urgently engage with the MHRD on the matter, raise our concerns in the Parliament and demand that the Bill be immediately sent to the Standing Committee for wider consultation. betteruniversities.in has drafted a letter addressed to the MPs along with consolidating a list of email addresses of various opposition members of the Parliament. The letter has already been translated into seven languages and an attempt to translate it in various other languages is also in progress. We hereby urge everyone to write to their own state representatives and request a blocking of the HECI Bill. Click here to see how you can participate in the email engagement process. Act quickly and share widely.